Some different finds this week. A good mixture of shopping venues too; local thrift stores, garage sales, out of town thrift stores and a complete surprise to me, a Community Garage Sale mixed with many vendor's open tents of an almost 'pop-up' sale of vintage. Win-win. Footed Avocado Green Fruit Dish, Sadler Poppy and Daisy cream and sugar and Italy metal framed picture. 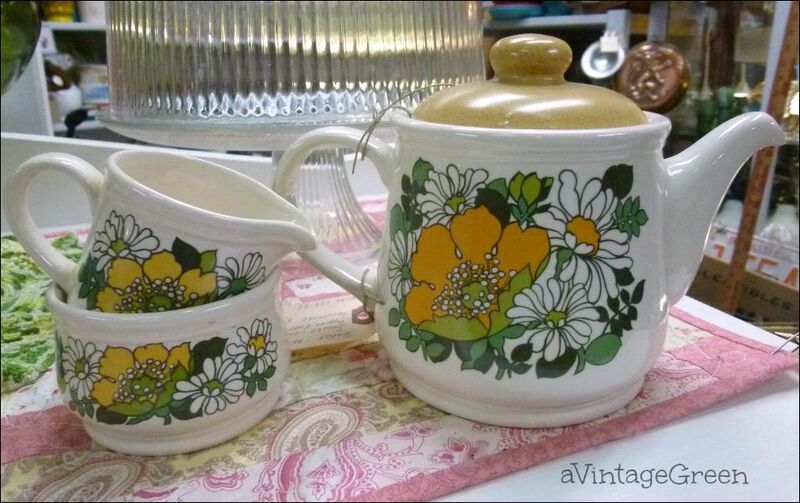 Sadler Poppy and Daisy teapot found weeks ago is now matched up with the cream and sugar found this past week. 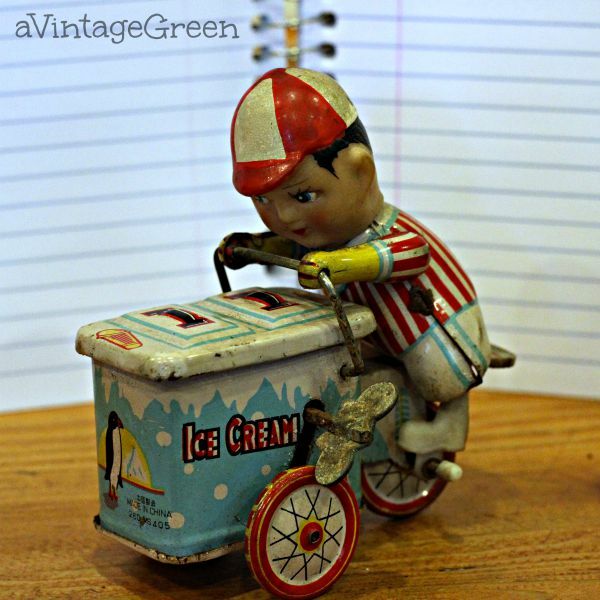 Vintage, Repro 1980 Ice Cream vendor tin litho, the little boy has a rubber face. 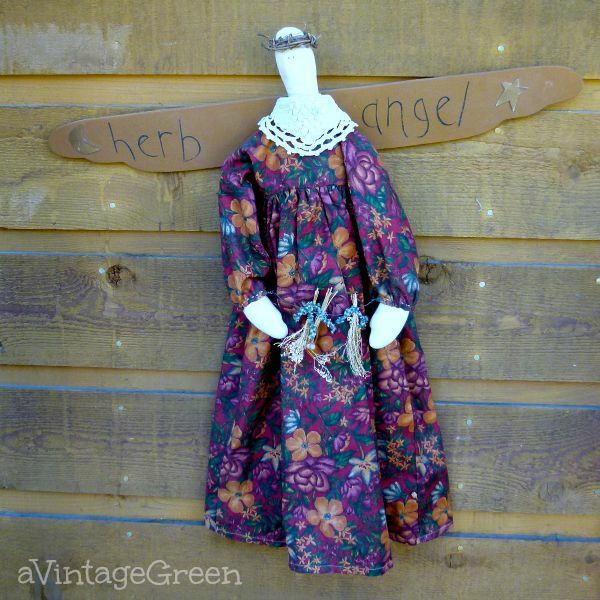 Herb Angel found at a once-a-year (4th Saturday in August) Community Garage Sale at the Local Farmer's Market. I have already marked the date on next years calendar. The Garage Sale included (for the FIRST time) open tents with resellers of vintage. 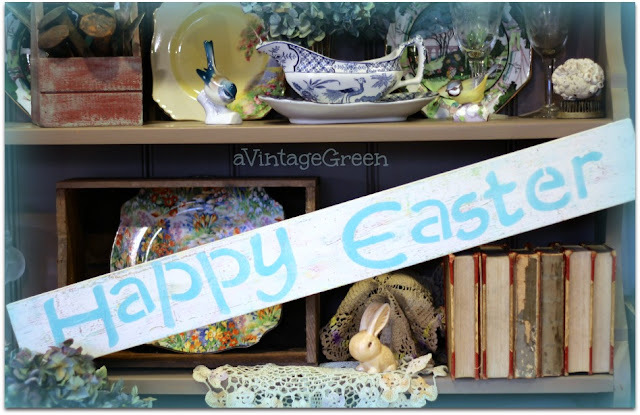 Great painted furniture, vintage kitchenware and a wonderful range of vintage home decoration items. If I had known this venue was happening I would have taken my wheeled shopping basket. 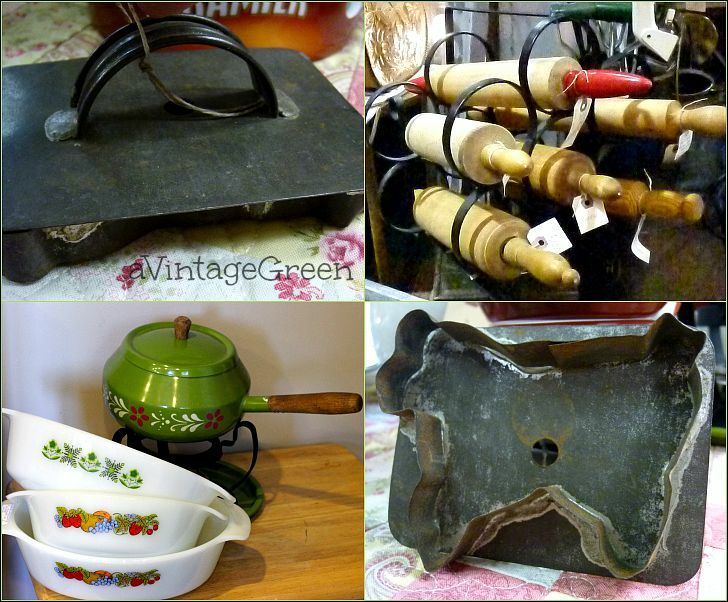 I picked up more chalk type paint and wax, the herb angel, the Fire King casseroles (above) and the vintage cow cookie cutter (above). 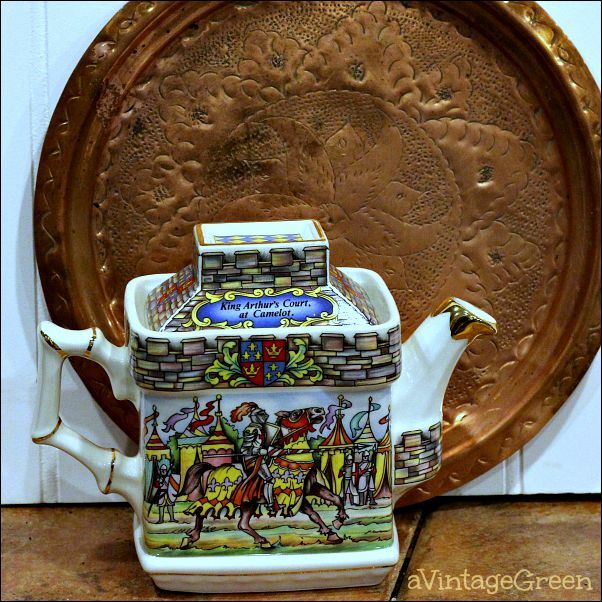 The Sadler King Arthur's Court At Camelot Teapot and Copper Tray were picked up at a favorite out of town thrift store (a day trip). The amber glass deco fruit bowl was a local garage sale find. 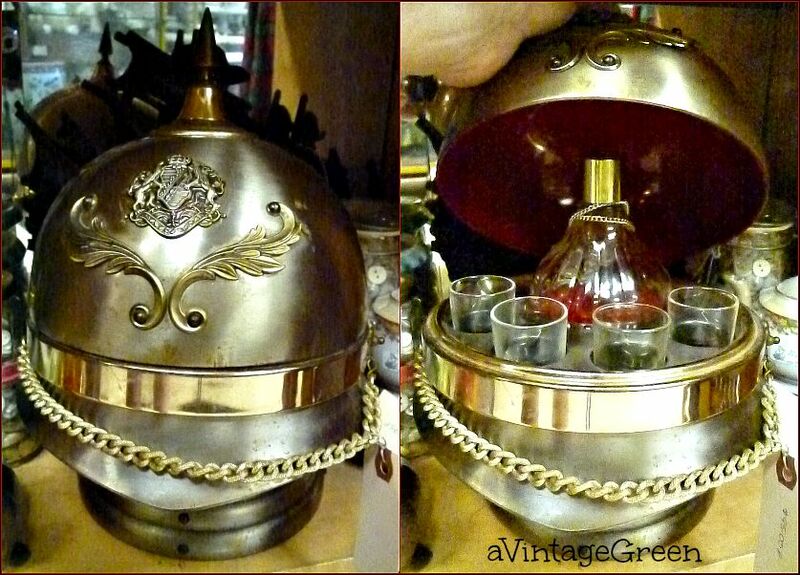 The Helmet Drinks Case was sold the day I put it the mall. I forgot to take a picture before I put it in my booth. Local garage sale find. The Brass Jester Doorstop (about 12 inches tall) has good balance and is very heavy. 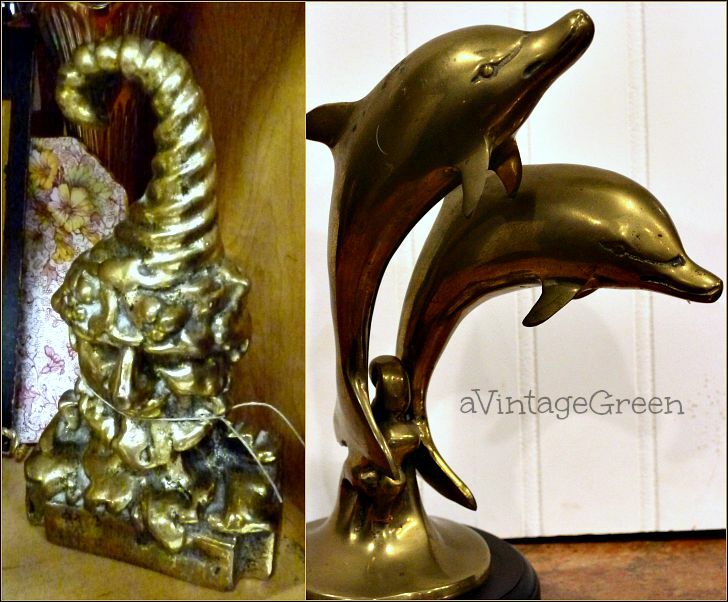 The Brass Dolphins are on a round wooden base. Both were local garage sale finds. 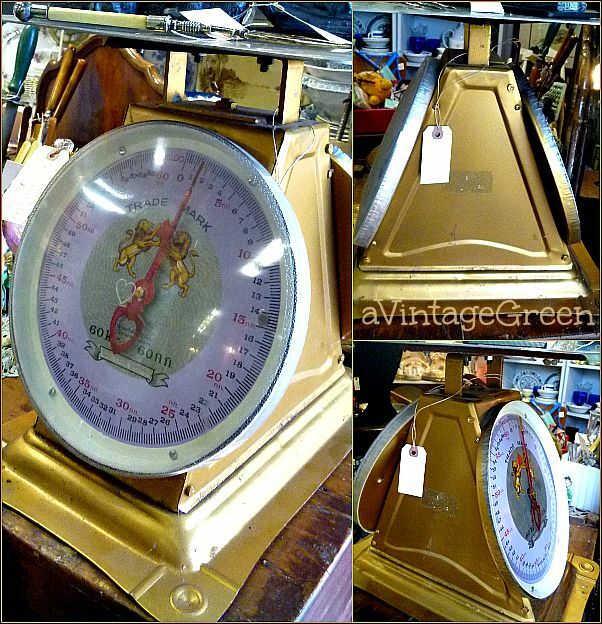 This double faced scale was the most 'different' local find this week. I didn't take a photo before I put it in my booth. Very heavy. The makers name is in a language I can't read. Kilogram scale. 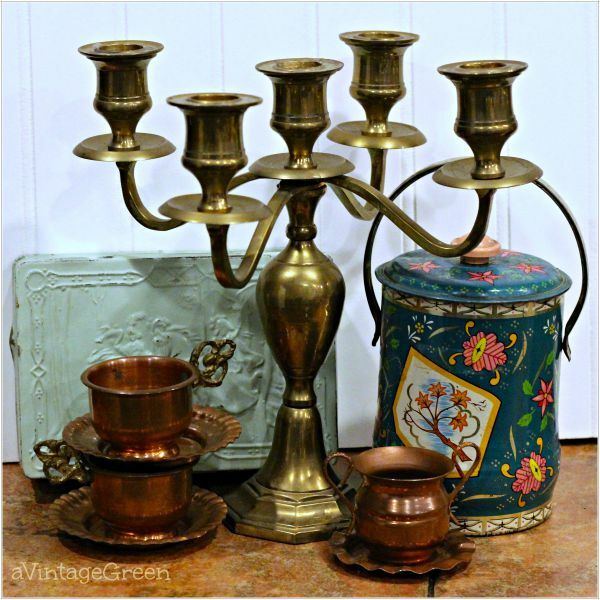 Brass Candle Holder for 5 candles along with two vintage tins, 2 copper demi cups and saucers and a small copper sugar with an attached plate, a mix of out of town and local thrift store finds. I love visiting other blogs that share thrifted finds. Judy of 20 North Ora is one of the bloggers who give us peeks into what she finds each week along with Denise of Second Time Around Finds, Donna of Distressed Donna Down Home, Eddie of Eddie-torial Comments, Linda of A La Carte, Cathy of My 1929 Charmer and Sherry of Back 2 Vintage (and more another post). Great finds - as usual! Thanks for the shout out! Great finds - as usual. Joy, you found some unusual items this time! 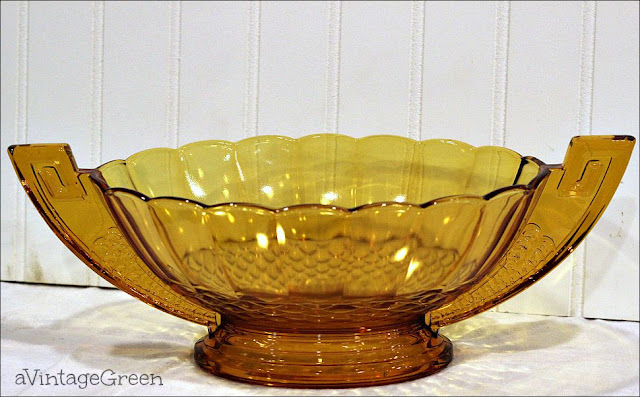 The amber glass deco bowl is gorgeous and my fav of your finds this week. Thanks for the shout out! I'm so happy I finally had time to share some of my thrifty finds this week! I went to my favorite junking store today and found some treasures myself! What wonderful finds!!! That Helmet Drinks Case would be my favorite!!! You have a real knack for finding good things. I am so happy you were able to match up your tea pot with the creamer and sugar bowl! Win! WIN!!! Thanks for the sweet shout out Joy! I'm going to climb back up in the blogging saddle over the weekend and catch everything up. I love that drinks case and the ice cream boy. Too cool and too sweet. First, thanks for the shout out. We are a great group of junkers! The cow cookie cutter is my favorite by the tiniest of margins. You found such wonderful treasures it was hard to choose. Why would a scale have two sides? Wonderful finds. You should have not trouble selling these if you wish. I loved the little ice cream boy. Really nice finds Joy. Love the little ice cream toy. 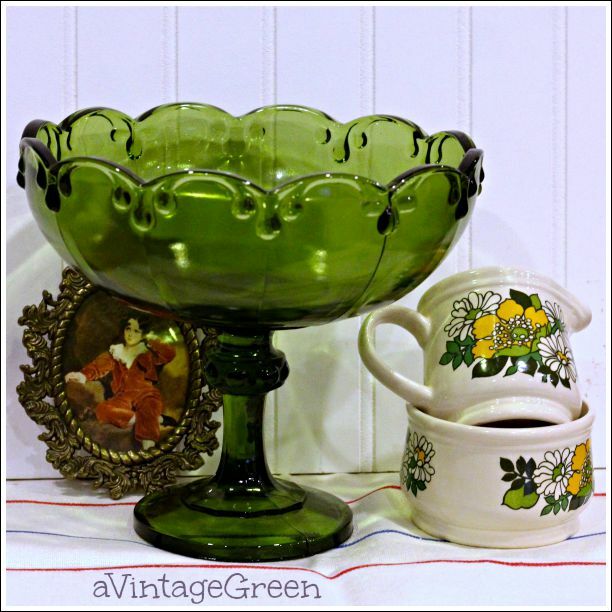 The green and amber glass pieces are beautiful.The old jade green tin looks really interesting. Great finds, I'm especially fond of footed fruit dishes. The hunt is so much fun, isn't it. You found some treasures. Thanks for playing today. Such beautiful finds Joy! Wow! You have a great bounty of beautiful items. Always a pleasure to stop by and say hello. Have a beautiful weekend and thank you for sharing. bowl for the tea pot you had already found. Have a great week! Your finds always amaze me....where do you find such lovely treasures?! :) I love the cute ice cream vendor. Thank you, sweet Joy, for sharing with Roses of Inspiration. Have a beautiful week. Hugs! You do find such good stuff. I love the cow cookie cutter. Pretty cool. Wow, more great finds, especially the brass pieces. Wow, these are such different finds than what I see while out pickin'! I just love that double faced scale. Thanks for listing other bloggers that post thrifted finds....they are all different than the ones I follow! These are such great finds! I love that you found the matching pieces for the teapot. That's so lucky! Thanks for sharing at Inspiration Thursday! Some great finds! Thanks for joining Home Sweet Home! You found some great things. I have never seen an Art Deco bowl like that. I think you really scored!